Spatial audio can be heard on the Gear VR either through streaming from Facebook or by side-loading videos for the Oculus Video app. To stream a video on Gear VR open the video in the Facebook Android app and tap the button on the top left marked “Watch in VR”. Alternatively the video will appear under the “Your Videos” tab of the Facebook 360 app. Instructions on creating videos with spatial audio for Facebook can be found here. The Oculus Video app for Gear VR, from version 1.43.8, supports side-loading of a full 8+2 channel mix from the Spatial Workstation. 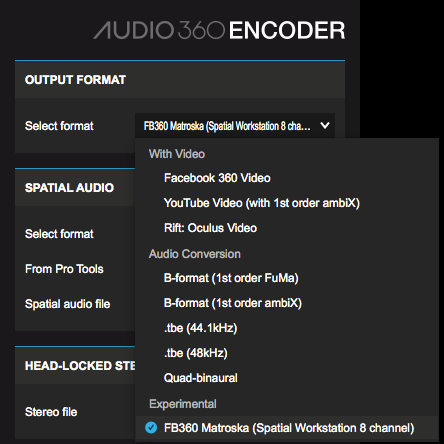 Preparing videos with spatial audio for upload to Facebook requires the Facebook 360 Encoder application. The Encoder is available with the Spatial Workstation VST and AAX Addon installers on macOS and Windows. Drop or load the multichannel spatial audio wav file. This is the audio that will rotate and respond when looking around a 360 video. The wav file can be of any sample rate, but is ultimately converted to 48000 samples per second. B-format (2nd order ambiX): Second order Ambisonics with ACN ordering and SN3D normalisation (9 channels), when using version 3.0.0 or later of the Spatial Workstation this would be the output of the 3D master from your audio session. If using a Spatial Workstation 8 Channel file, ensure the From Pro Tools checkbox is ticked if the spatial audio file was exported from Pro Tools. Optionally, you can also drop or load a stereo file for head-locked audio. This is audio that will not rotate when looking around a 360 video. To sideload a video with only B-format audio (ambiX, FuMa), we would recommend using the FB360 Encoder to create a video file with the audio tracks muxed in. Follow the same steps outlined in the previous section to create the video file, rename and transfer it to the phone to play it back in Oculus video.